Stephen Fry may well be a national treasure, and now we’ll get to listen to him while visiting some of the country’s other treasures too. 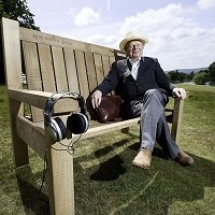 Plonk yourself down on one of the National Trust’s new benches and Mr Fry will pop out of the woodwork (so to speak), with a little bit of information on what you’re looking at. John Sargeant, cricketer David Gower and comedian Miranda Hart are among others who will be brought to us from the National Trust. Five minutes snippets have been recorded about Calke Abbey in Derbyshire and Northumberland’s Cragside, while philosopher Alain de Botton is the voice of choice at Castle Ward in Northern Ireland. Some effort has gone into pairing the narrators with relevant sights; Stephen Fry said he hoped his bench at Felbrigg Hall in Norfolk would provide “comfort, balm and solace for many a weary bottom”, notes The Guardian. It’s an interesting idea, but it remains to be seen how keen people will be to have their countryside strolls punctuated by a celebrity’s drawl. Sometimes it’s good to just get away, you know. But we can’t help but wonder – instead of building this voice recording into the benches, wouldn’t it have been easier and cheaper to just make an app?